Confession. I don’t recall the last time that I was in the Christmas Spirit. Don’t get me wrong. I absolutely love Christmas. But that warm anticipatory feeling that I’d get as a child, ceased sometime before high school. After last year, I realized that I didn’t want my Christmas of 2018 to be the same as it had been in previous years. I didn’t want to wake up on Christmas morning only concerned about which foods to eat, which outfit to wear, and whether or not I purchased all the right presents. I wanted this year to be different. So at the start of this past October, I started getting ready. By October 1st, I’d already planned the weekend that my family and I would go apple picking at an orchard. This was in effort to get into the “Fall” spirit. But each weekend brought on a different weather fatality that unfortunately altered our plans. Then Thanksgiving came. I planned on baking some pretty awesome vegan treats. Yeah, for whatever reason that didn’t happen either. So as December approached, I found myself nowhere near having the “Christmas Spirit,” despite my elaborate plans at the start of October. But then, unexpectedly, and quite randomly in my opinion, the Lord challenged me to cut out all entertainment for 21 days. Yeah. Movies, shows (This is Us! ), my random YouTube videos, endless Facebook videos that Y'all like share, and my love to watch different interviews (yas...Michelle Obama’s recent book tour interviews). Well, I began doing this on Nov. 24th, and after 10 or so days...I still wasn’t in the Christmas Spirit. So when thinking about this one afternoon, the Lord showed me that I was attempting, and failing miserably, at conjuring up this Christmas Spirit, because I equated the Christmas Spirit to my ability to resuscitate nostalgia. Nostalgia that was filled with sweet times as a child, giggly emotions, and anticipatory angst that was both fun and pure. Yet, a nostalgia which honestly had nothing to do with Him (Christ). How often do we do this? How often do we find the necessity to reenact (i.e. traditions, experiences, etc.) in order to relive an emotion…and call that having the Christmas Spirit? Entertainment is usually where I run towards to conjure up this nostalgia. By doing this, I place my faith in a movie or a song to quench a thirst that was once readily filled by waking up on Christmas day and seeing a considerable amount of presents under a tree. But here’s what I’ve learned this year. I need to redefine what it means to be in the Christmas Spirit. To be in the Christmas Spirit is not playing Mariah Carey’s “All I want for Christmas” on repeat (such a good song right?! 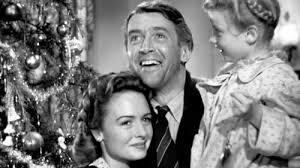 ), nor watching Home Alone, It’s a Wonderful Life and a host of Hallmark Movies. Trust me. I’ve tried them all..
To be in the Christmas Spirit is to practice being more aware of the Holy Spirit. So often we hear that Christmas isn’t about presents but His Presence. But how much of His Presence are we actively seeking Dec. 1st- 24th? Maybe, exchanging presents isn’t the culprit to Christmas. Perhaps it’s the lack of being aware of His Presence leading up to Christmas that can make giving presents stressful, preparing food a burden, and going through a rehearsed schedule, year to year, as if going through the motions like any other holiday. So as we wait for Dec. 25th, the celebration of Jesus’ birthday, the best gift to Earth, let us not unconsciously forsake the gift we have right now…which is His Spirit. His Presence is readily available and very much wanting to interact with you. Maybe next year, I’ll bake and decorate some cookies with Evan Jr., our son. Maybe I’ll pop some homemade popcorn and stream my favorite Christmas movie to watch with Evan Sr.
And maybe, just maybe, I’ll go to a Christmas lighting ceremony with them both. What are some things you could do to be more aware of the Presence of the Holy Spirit right now? Is it baking cookies? Watching that movie? Or does He want you to be more aware and appreciative of the Holy Spirit? For the next couple of days, I challenge you to unplug from any “go to” thing that is crowding you from being more aware of the Holy Spirit. Consider this not a fast. But more so, a passionate pursuit of your Comforter, Guide, Intercessor, and Lover. Your “go to” could be television, Hulu, Netflix, food, social media, or even work. Ask the Lord, and He will graciously guide you.